Wonderfully Cut Peridot – Just That is Enough to Set Your Gem Apart! Featured today is a natural and treatment free Peridot of 3.66 carats from Burma set in sterling silver as a Mercury Talisman ring. The symbol of Mercury stands in relief on the shanks of the ring. The rectangular cushion cut peridot has a luscious and deep olive green color and fantastic clarity. 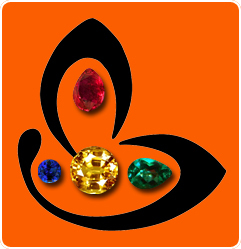 Burma is known for it natural gemstones and the gemstone reflects the pedigree through its electric lustre aside of the other appealing characteristics. Peridot or zabarjad zaytuni is the substitute gemstone of natural emerald/ panna. It is used in a talisman to harness the energies of the planet Mercury/ Budh. It is also known as Chrysolite /Olivine, and finds a mention among the gemstones in the Holy Bible too. Please take a note that finding a beautifully cut peridot itself makes it a suitable candidate for commanding a premium. 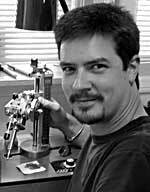 Peridot is not an easy gem when it comes to cutting and faceting. The cutter has to be extremely careful about the inclusions not simply because he must cut the gem as to bring out its maximum allure, also because the internal tension of the peridot is pretty high. Comments A gem with an extraordinary richness of color, lustre and flawless appearance besides being natural and treatment of color is the right choice for effective gem therapy. It must also have the right carat weight to make it the ideal one. Featured today is a natural treatment free Ceylon hessonite of 2.89 carat set in sterling silver as a Rahu talisman pendant. The square cushion cut hessonite has a rich deep burnt cinnamon orange color and amazing clarity. Hessonite also known as gomed/ gomedhaka is the gemstone of Rahu or the North Node of the Moon. Hessonite garnet is a grossular garnet that comes in shades of orange brown but the cinnamon orange color is the ideal jyotish color. In Vedic astrology, Rahu is a karmic planet and its planetary periods as well as certain placements in the natal chart can be very challenging for an individual. 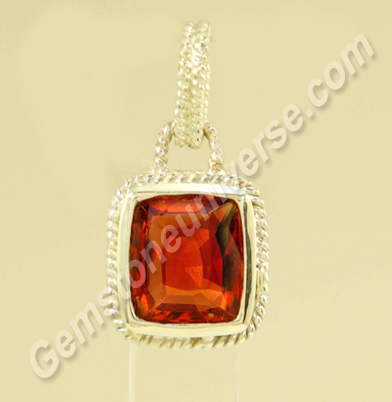 Wearing a natural jyotish quality hessonite can bring much relief. In certain cases, a strong and favorable Rahu in the natal chart can bestow tremendous material success and wealth. 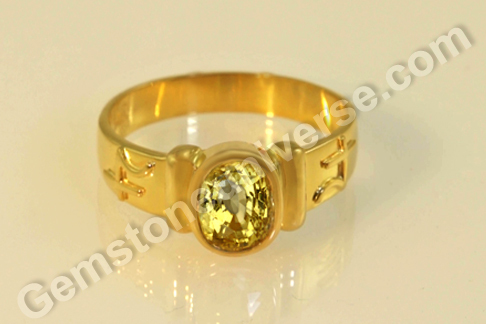 Comments One gemstone that is really popular in India is the Yellow sapphire. With a country of over a billion people that takes marriage very seriously, it is better known as a gem that has the ability to put the prospects for marriage on a fast track mode! Quite true, in case of female individuals! However, generalisations in Vedic astrology hardly hold true, the placement of Jupiter in the natal chart of the individual must be considered at all costs. Also, as a gemstone of Jupiter its role in an individual’s life encompasses much more than all that goes around as myths, legends and information passed on in general culture. Featured today is a Natural unheated Ceylon yellow sapphire of 2.66 carats set in 22-karat gold as a Jupiter talisman ring. 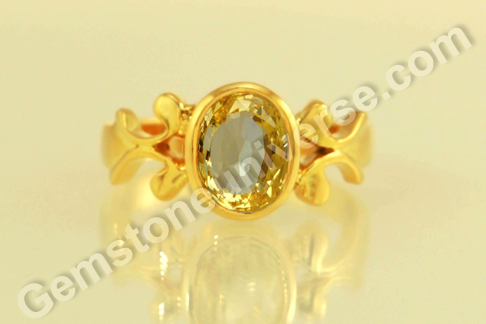 The fully natural mixed cut yellow sapphire has been bestowed with a luscious and alluring golden butter yellow color. The gem has both fire and water – implying that there is life/ a natural palpable force within the gem. The watery quality refers to a clarity and shimmery electric lustre that set the gem apart. A fantastic jyotish gem that has been set in a ring with the symbol of Jupiter standing in relief on the shanks. In Vedic astrology, Natural yellow sapphire or pukhraj is the gem of Planet Jupiter/ Guru/ Brihaspati. 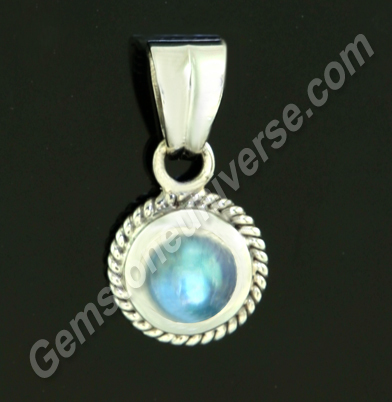 It is a lovely, mellow gem that is used in a talisman to harness the energies of Jupiter. Jupiter in the solar system is the heaviest planet. The word guru also means ‘weighty’ referring not just to the gross weight but to the profoundness of the celestial teacher’s wisdom! In the sacred texts guru/ Brihaspati is called self-illuminating – he radiates much more power and light than he receives from a luminary. Jupiter is the teacher of the gods and rules over the domains of spirituality, wisdom, wealth, progress, law and justice/ dharma among several other things. Comments One could be easily lost for words upon beholding a gem as splendid as this. Every gemstone going past your eye will have a different story to tell, and comprehend you will for it is energy touching energy very subtly. 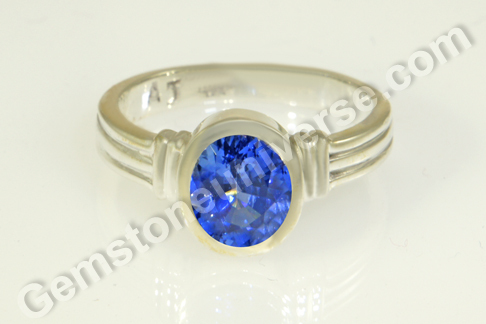 Featured today is a natural Ceylon Blue Sapphire of 2.99 carats set in Sterling silver as a Saturn talisman ring. The rectangular cushion cut blue sapphire from Sri Lanka is fully natural and treatment free. It has excellent clarity and a very pleasant and appealing light royal blue color. The blue sapphire has a depth, which has not much to do with its physical characteristics, but more about the metaphysical details where it portrays essence of its planetary deity. 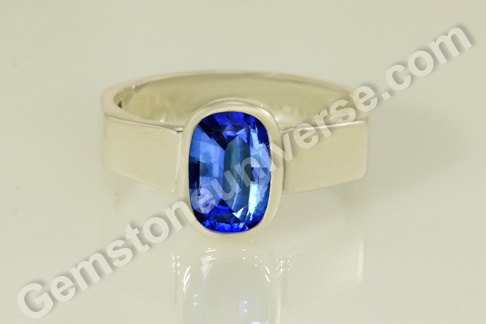 In Vedic astrology, natural blue sapphire/ neelam gemstone is the gem of Lord Saturn/ Shanidev. It is a powerhouse of intense energy and can be used in a talisman to harness the saatvik energies of this karmic planet. Among colored gemstones, the ‘color’ of the gem determines its value in a big way. And if ‘color’ comes complimented by the fact that the gem is ‘treatment free and natural’ and/or has good clarity, the price will go up by geometric progression. 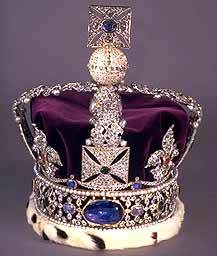 Interestingly, in the Hebrew tradition it is believed that the Ten Commandments were given to Moses on tablets made of Blue sapphire. The blue sapphire tablets or the Tablets of Testimony symbolised the heavens and purity. 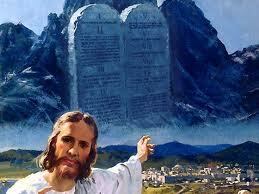 It is widely believed that the commandments were not just written but bored into the sapphire tablets by the “finger of God”. Comments The Garuda tri-ratna pendant featured today is a heart-warming talisman – one that stands apart not just because of its beauty but because, the design does complete justice to the beauty of the gemstones and puts them across in their full glory and splendor. Next time when you order your talisman, give a thought to the design you would like – for it’s not just a gemstone or a talisman, its something that will be on your person for a long time to come. Get the wings – give yourself freedom, expansive living with this custom made Garuda tri-ratna pendant. This talisman has a pear shaped natural peridot from Pakistan of 3.95 carats. 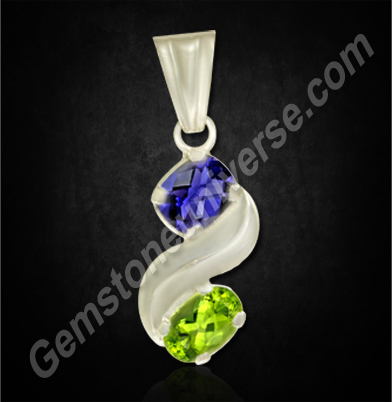 The gem has a lovely olivine green color and excellent clarity. In the center is an oval shaped chrysoberyl cat’s eye from Srilanka of 2.02 carats. The natural Ceylon cat’s eye has a gorgeous golden green color and superb chatoyancy. In addition to the above, there is a classic emerald cut natural imperial golden yellow topaz from Brazil of 2.89 carats with fine sherry color and excellent clarity. The talisman is also extraordinary as all gems are surrounded by respective planetary herb bhasma / sacred ash, sealed in the design element around them. The peridot has the apamarg bhasma, cat’s eye has the kusha bhasma and the imperial golden topaz has the ashwath bhasma sealed around it in the tubular design element. Natural Peridot also known as olivine/ zabarjad is the substitute gem for natural emerald/ panna and is the gemstone of Mercury/ Budh. Apamarga is the planetary herb of Mercury. Chrysoberyl cat’s eye / lehsunia/ vaidurya is the gemstone of Ketu also known as South Node of the Moon. Kusha is the planetary herb of Ketu. Imperial golden yellow topaz is the substitute gem of natural yellow sapphire / pukhraj and is the gemstone of planet Jupiter/ Guru/ Brihaspati. Ashwath/ pipal is the planetary herb of Jupiter. All Gemstones are Precious. Period. Comments Gone are the days when there was a distinction between precious and semi-precious gemstones. The formation of any gemstone takes hundreds and thousands of years. With this understanding, it is only logical that creation of more mineral wealth will take almost similar time therefore, what gemstones we have today are a treasure of immeasurable value. 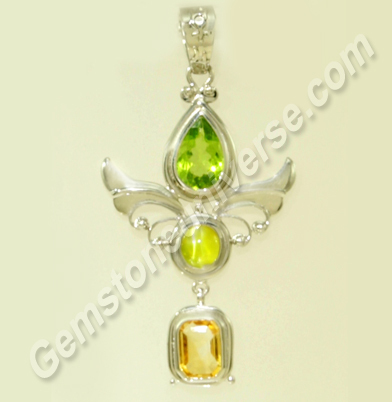 Featured today is a two-gem pendant that has two upratnas – natural Iolite and natural Peridot set in sterling silver. 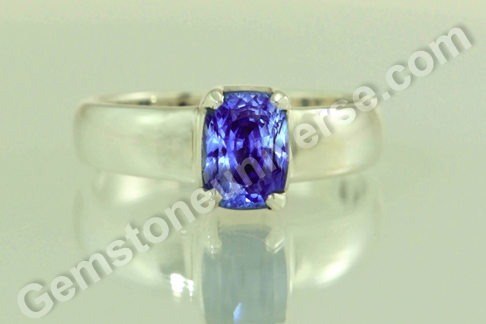 The natural and treatment free Iolite of 2.14 carats is one of the best from Madagascar with royal bluish violet color. The cushion cut gem has checkerboard faceting and has fantastic clarity. The natural peridot of 3.56 carats is a gem of a gem from the mines of Pakistan with the luscious olivine color. 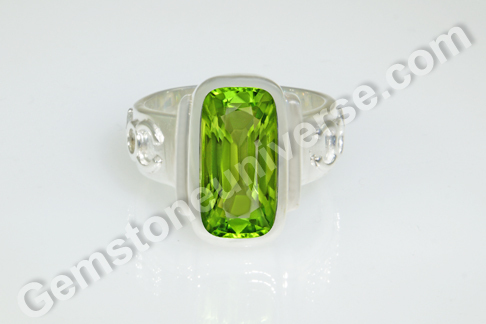 The natural treatment free peridot has an electric color and fantastic clarity. It is heartening to note that the individuals are becoming increasingly discerning and aware of gemstones and real value of natural gems – whether they be the primary gems or the alternatives/upratnas. More importantly what is remarkable is that instead of delaying gem therapy or opting for inferior baubles in the name of gems, individuals are embracing upratnas with the same love and adulation that ANY GEMSTONE deserves! In Vedic astrology, natural iolite/ neeli is the substitute gem for natural blue sapphire/ neelam and is used to harness the saatvik energies of planet Saturn/ Shanidev. Natural Peridot also known as olivine or zabarjad is the substitute gemstone for natural emerald/ panna/ zamrud and is used to harness the energy of Planet Mercury/ Budh. Mercury and Saturn have naisargik mitrata/ planetary friendship and their energies come together in harmony in the beautiful pendant.